Charitable gifts — outright gifts, pledges, and planned gifts — from individuals, corporations, foundations and other organizations in support of the Honors College are made through the Auburn University Foundation. Incorporated in 1960 as an Alabama nonprofit corporation and recognized by the Internal Revenue Service as a tax-exempt 501(c)(3) public charity, the Auburn University Foundation operates separately and distinctly from Auburn University, and is led by a volunteer board of directors working in cooperation with Auburn University’s fundraising professionals in its Office of Development. 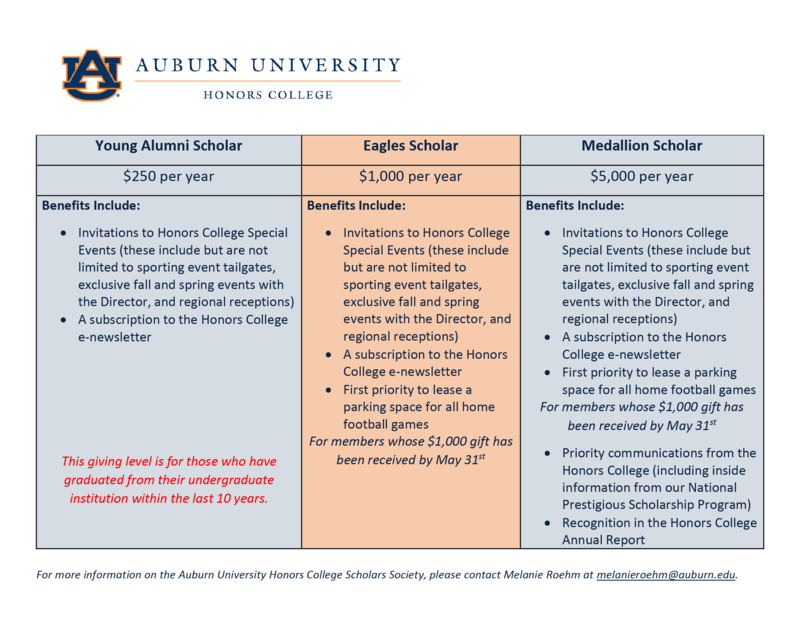 To make a tax-deductible, charitable donation to Auburn, click the “Give to Honors” button below, or contact Angie Stephens with the Honors College’s Development team. The Honors College is excited to introduce the Honors College Scholars Society, a new organization for dedicated donors who support the ideals of the college, and have a desire to see our programs and students be successful. Membership in the Scholars Society gives donors exclusive access to Honors College special activities like tailgates, receptions and the director's invitation-only events. Members will never be out of the loop with a subscription to our e-newsletter. Several membership levels even include opportunities for priority parking at all home football games. We hope you will consider supporting the Honors College at Auburn University through membership in this society. Your philanthropy allows our students to achieve more than ever before. Join the Honors College Scholars Society, and thank for your consideration, and for your commitment to the outstanding students of the Honors College at Auburn University.